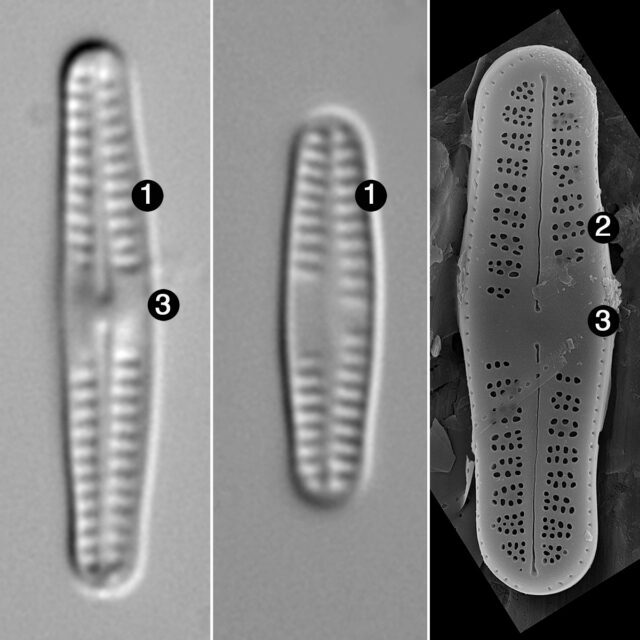 Achnanthidium kriegeri should be considered for transfer to the genus Rossithidium. Cells have a solitary growth habit. 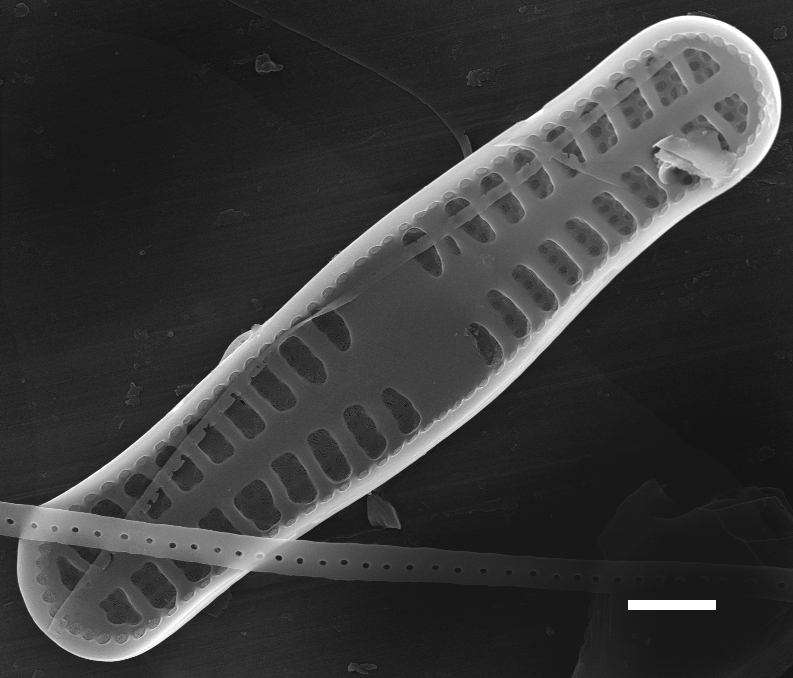 One plastid is present in living cells. Frustules are monoraphid with a concave raphe valve and convex rapheless valve. Valves are linear or linear-elliptical with rounded, slightly drawn-out, or slightly capitate ends, 6-21 (usually 7-17) µm in length. The terminal and central external raphe ends are slightly expanded, no terminal fissures are present. Internally, the central raphe ends are deflected to opposite sides. The striae are parallel throughout both valves. 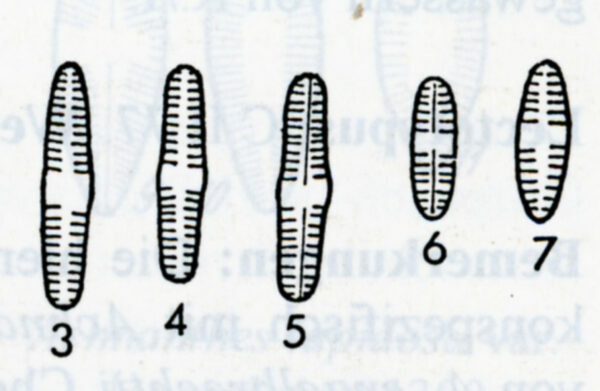 The striae consist of two rows of areolae, with exceptions. At the valve margin the number of rows of areolae is often reduced to one. At the sternum and ends, the number of rows of areolae is often three. An asymmetrical hyaline area is present in the central part of both valves. One row of elongated areolae is present on the valve mantle; the row is continuous on the rapheless valve and interrupted at the apices of the raphe valve. External openings of the areolae are circular, oval, or irregular in shape, more or less isodiametric, approximately 50-90 nm across and not occluded. 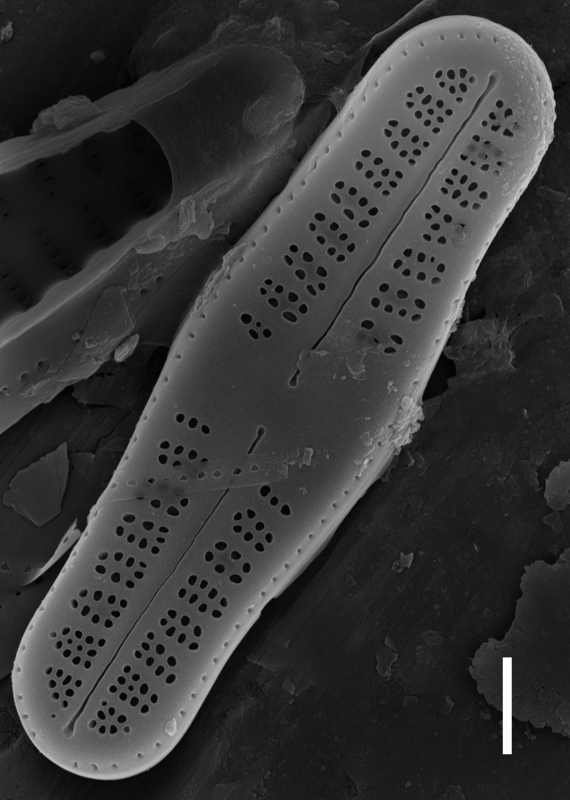 Internal openings of the areolae are elliptical occluded by hymens. The hymens are perforated by small pores, which are approximately 5-10 nm wide and 5-20 nm long. Internally, the interstriae are raised, so that striae appear as shallow chambers. The girdle bands are unornamented and open. Schalen linear-Ianzettlich mit breit gerundeten Enden und oft leicht aufgetriebener Mitte. Die kurzen Stücke elliptisch. 7-20 µm lang, 2-2,8 µm breit. Streifung auf beiden Schalen nur sehr wenig strahlend, in der Mitte meist unterbrochen, grob, etwa. 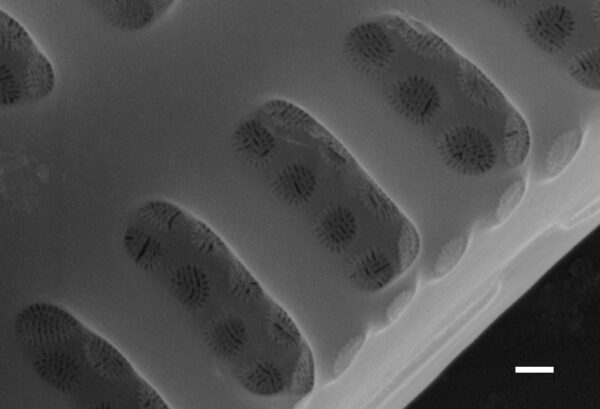 24 Streifen in 10 µm. Raphe sehr zart, gerade. Längsarea schmal, in der Mitte meist zu einer breiten Querbinde erweitert. - Verwandt mit A. nodosa, von der sie sich durch die geringe Breite und die viel feinere Streifung unterscheidet. - Vorkommen: In 16 Proben mit pH: 6,8-6,9. Vor allem in allen Proben aus Moosrasen und von Felswänden in Saanatunturi und Jehkatstunturi. Original text and images reproduced with permission by Deutschen Botanischen Gesellschaft.